Alan Turing posthumous pardon for “gross indecency”: Does it mean anything? The legendary computer scientist and codebreaker may finally receive a posthumous pardon. So what? What do we do with the knowledge that people not all that different from ourselves have behaved with astounding stupidity and cruelty, over and over again, in the recent past? Become paranoid of ourselves? This is the kind of question that haunts me when I think of Alan Turing. For those who don’t know, Turing was the most essential mathematician leading to the invention of computers and the birth of my discipline, computer science. I couldn’t owe him more. He was also one of the greatest war heroes we have known, for he applied computer science in its birthing hour to break Enigma, a notorious Nazi code, and is generally thought to have shortened the course of World War II by perhaps two years. He might have saved millions of lives, even nations. We’re not done. In the years before Turing’s death in 1954, he made a huge contribution to philosophy and culture by articulating the underpinnings of artificial intelligence, including what’s come to be known as the famous “Turing test” thought experiment. And yet he did that with a degree of sophistication—including a dose of salutary self-doubt—that derivative AI enthusiasts rarely achieve. If only this wonderful roster could suffice as a summary of a great life. Alas, we must also remember how Turing died. He was gay at a time when that was an illegal state of being. He was prosecuted after the war and subjected to “chemical castration.” He apparently killed himself, eating an apple laced with cyanide, at age 41. We will never know what further gifts he could have given. Now, after decades of murmurs and false starts, it appears the U.K. government will produce a posthumous pardon. How can we think about this? It isn’t easy. Of course the prosecution of Turing was an abomination. But as present-day observers, are we stroking ourselves on the back a little too readily by suggesting we now have the perspicuity from which to declare a pardon to this one brilliant man? What about the almost 50,000 other men in the United Kingdom convicted in the same way? Do you have to be one of the highest-performing people of the century to merit a pardon under an immoral law that has been repudiated? The very idea of a pardon suggests that the government speaks from moral high ground and that the prosecution might have been inadvertently based on false evidence or some other bloodless mistake. There is a degree of implicit misrepresentation, though it is never easy for a government to own up to its own failings. (It took about a century and a half after the official end of slavery in the United States for the government to finally state an apology, which was intoned by President Bill Clinton.) The notion of pardon sends a confused message. Shouldn’t there be an apology to all those convicted, directed to their memories and their descendants? I am not British citizen, but as a computer scientist, I think I have some small standing to voice a complaint. One thing Olive told me was that Turing was not a person who revealed a great deal of himself in the lab, but he did set a tone for how to do computer science, and she feels that tone living on through computer researchers today, even if it’s not clear how to articulate exactly what it entails. Turing was both a prototype of the “nerdy” personality we associate with digital technology today, and a romantic, daring, colorful soul. In pure mathematics, it is commonly recognized that while the math itself is abstract, the way we understand math is cultural, and therefore it’s relevant to know the human stories behind mathematical advances. We benefit from knowing about Paul Erdös’ eccentric, rambling life, for instance, because it informs our appreciation of his rambling accomplishments. Understanding a little about him helps us enter into his mindset and trace his steps. But computer science has taken on a somewhat less humanistic sensibility. This is unfortunate. I have seen the Turing test taught many times, in philosophy or computer science departments, and the circumstances of Turing’s life at the time are rarely brought into the narrative. The test, published in 1950, was Turing’s thought experiment in which he asks whether we would, so to speak, deny personhood to a computer that could fool us into thinking it was a person in the course of a conversation. But Turing wrote of this idea during a troubled period of his life, just as he himself was being denied personhood. Furthermore, he was being persecuted by a government that he had helped triumph over fascism, the ideology most based on denying the humanity of others. Might Turing’s notion of the test have been an indictment of how we judge each other’s humanity? Might it have been a comforting fantasy, an escape into an abstract form of existence where no one is gay or straight, but only pure mind? Turing didn’t live long enough to say all he probably would have about his thinking. In a footnote he speculates that even if a computer became a “person” according to empirical criteria, both it and a natural human would still derive personhood from a source beyond physics, from the divine. Whatever the test meant to Turing in his final days, I don’t detect hatred, vengeance, or really any outward aggression in his voice. This is remarkable. I can hardly imagine being in similar circumstances without lashing out at my persecutors. 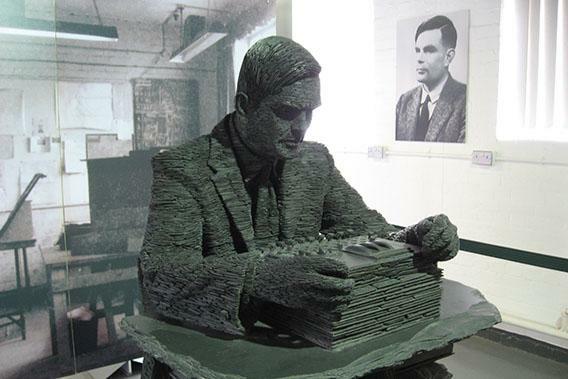 This is Turing’s legacy, and any pardon coming so late in the game is nothing but dust and posturing in comparison.